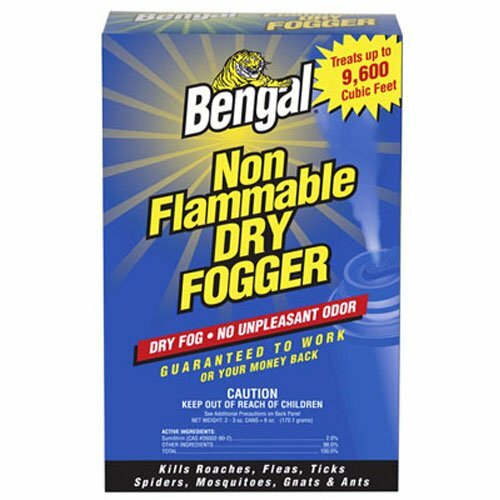 Bengal Indoor Dry Fogger is a dry penetrating fog that is conveniently clean and leaves behind no mess or unpleasant odor. The non-flammable formula is specially designed to kill roaches, ants, fleas, spiders, crickets, ticks and houseflies. Treats up to 9,600 CUFT and 1,200 SQFT with 8' ceilings. Available in a 2 pack, 2-3 ounces. If you have any questions about this product by Bengal Chemical, contact us by completing and submitting the form below. If you are looking for a specif part number, please include it with your message.